Since 2011, ACOPIA has focused its efforts on a new project for the international youth named the Asia Hope Camp. The Camp operates under the slogan “beyond natural disasters, to the world, to the future.” It aims to bridge the global youth through the facilitation of multicultural exchange both in and out of Korea. The Asia Hope Camp Organization (ACOPIA) works in cooperation with other institutions in order to achieve its mission. Korea Plaza Hiroba, the Korea-Japan Society and Culture Forum (KJ Forum), ACOPIA Entertainment, ACOPIA Life Long Education Center, ACOPIA Café and ACOPIA Friendship International in Japan are the main pillars that allow the proper functioning of ACOPIA. A project spearheaded by the young members of Korean society, this aims to highlight and emphasize the many volunteer opportunities that can be found all over the world. Koreans continue to be engaged in this endeavor. (b) Increasing our interaction with other international volunteer organizations. Our volunteer activities have attracted Korean and Japanese people so far, but the nature of our work is without borders. We aim to gather people from a variety of nationalities. Therefore, our goal is to expand our horizons and make Asia Hope Camp a "truly International Work Camp". Asia Hope Camp not only provides a warm environment for the global youth to interact and work together, but it also aims to contribute in the alleviation of poverty in impoverished regions in Asia through the promotion of outreach and social activities. Korea-Japan Society and Culture Forum is a Non-governmental Organization (NGO) established in 1999 in Korea, providing opportunities to exchange ideas and discuss Korea-Japan disputes. Since ACOPIA is a non-profit government organization, the HIROBA Company was created to manage the financial and taxation affairs of ACOPIA. In October 2013 HIROBA was registered with the Office of National Tax Administration. The role of HIROBA is to support ACOPIA’s operation as an independent NGO and to sponsor the income or profit-making programs that will allow ACOPIA to meet their financial budget and comply with taxation regulation. ACOPIA Entertainment supports K-POP Camps and auditions for young people in countries all over the world. Participants can apply for auditions with famous Korean music agencies with the support of ACOPIA Entertainment. ACOPIA Café offers environments of language exchanges between interns and customers, one of the best ways for mutual understanding of languages and cultures. ACOPIA Café welcomes open-minded individuals who are interested in learning from other cultures. Interns from all over the world work at the ACOPIA Café in order to improve the management and promotion of the café as well as organizing events and language conversations regularly. At ACOPIA Café, there are hot and cold beverages, snacks, Fair Trade Coffee and official Kumamon products available for purchase. ACOPIA Lifelong Education Center offers a Korean Language Program for Japanese people. 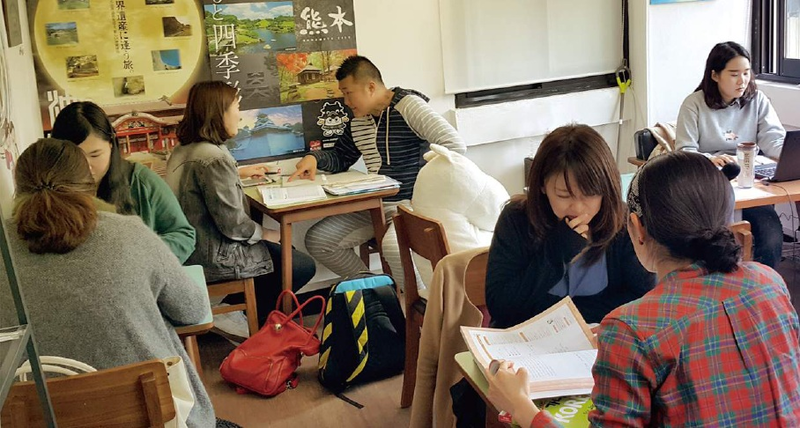 Foreign interns who work at ACOPIA can also take free Korean classes at the ACOPIA Lifelong Education Center and be friend with their Korean teachers. ACOPIA Friendship International is the Japanese branch of Asia Hope Camp Organization located in Kumamoto, Japan. Immediately after the tsunami hit Northeast of Japan in 2011, the organization began recruiting volunteers in South Korea to support the recovery in the affected Japanese prefecture of Miyagi. The organization was successful in bringing 50 volunteer Korean students to assist in recovery and outreach work. This whole process was filmed in a documentary and was broadcasted in South Korea. It was through this that we were able to highlight the unbreakable tie that exists between the nations of Korea and Japan, despite their strained governmental relations at the time. Aside from this, the Korea-Japan Forum has also been holding volunteer opportunities for Korean and Japanese high school students annually at the Izumo shore in the Shimane Prefecture since 2010. Our partner organization in Japan is the International Section of Shimane prefecture office. We select 20 applicants in Korea and hold monthly workshops from April to June. The workshops consist of 3 parts: global environment, volunteer work, and international exchange. Each group studies individually for each topic. In order to introduce our work to the world, and to lead a meaningful fruit in the International Work Camp, we need cooperation from people like you who share common purposes and passions. We also want to help raise our level of service towards the community with your kind help and advice. The new era of international exchange and cooperation is inevitable. With this, we sincerely hope that you take part in building a more peaceful and progressive society through our organization. Study with Japanese students and discover the Japanese culture. This program is conducted at the Kumamoto Prefectural University Japanese Language Education Laboratory. Professor BABA Ryoji, the highest authority in the field of Japanese language education, is responsible for the entire program. JLNE is a Japanese language course conducted by Japanese university students (graduate students) who major in Japanese language education. This program is a one month training program organized by Asia Hope Camp Organization and the International Trade Department of Kumamoto City, Kyushu, Japan and is supported by Korea-Japan Socio-cultural Forum. This is an unpaid internship program in Asia Hope Camp offices in Seoul. The program can last 1 to 6 months during the whole year. Interns will participate in various indoors and outdoors activities while living together at the Sharehouse. Interns also have the opportunity to take part in Korean language and K-POP Dance classes once or twice a week. • Original activity: each intern is in charge of a personal creative activity for ACOPIA such as organizing events related to the intern country or culture or creating partnership with Universities.